Preheat your oven to 350 degrees Fahrenheit, and lightly grease and flour a 10" round Bundt Cake pan. Start off by coring and quartering the apple, peeling the bananas, and measuring out the maple syrup. Once that's all done, stick it all in a high speed blender until it's smooth. I usually do this in a two step process. I find it's easier to start with the syrup and apples, stopping to push the apples down once in a while if needed. Once I've got the apples going, I like to add the bananas in through the opening in the top of my Vitamix. It will work adding it all at once, it's just a lot of things to stuff in the blender all at once, and it's harder to get it all mixed together. Set your wet ingredients aside for a moment and measure out the dry ingredients (oat flour, almond flour, chopped nuts, whole wheat flour, baking powder, baking soda and salt). 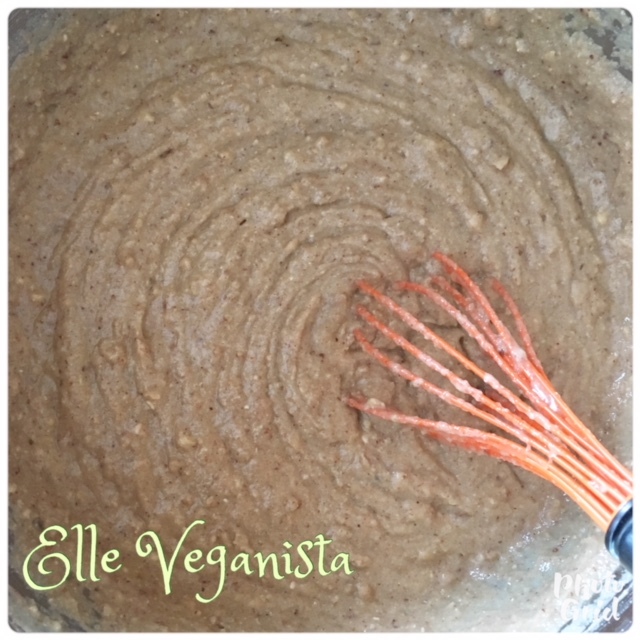 A quick note about the almond flour, oat flour, and almonds. Instead of buying almond flour and oat flour from the store, I just blend some oats and almonds up in the dry attachment of my vitamix (this also could be done in a food processor). Additionally, I usually end up just increasing the almond flour to about 1 1/2 cups and eliminate the chopped nuts altogether, because I find with some of my kids, the less chunks the better. I personally love the nutty pieces, but I thought I'd just mention this for those of you who are in the same boat as me and find it's just easier to feed kids a nice smooth dessert that doesn't necessarily distinguish exactly what's contained in it. So once you've determined just how nutty you're going to make your cake, throw all those dry ingredients into a large mixing bowl. The 8 cup Pyrex dish shown in the pictures wasn't quite big enough by the way, I ended up moving it to a bigger bowl. This happens almost every time I make this cake, I forget just how much batter I end up with. Pour your wet ingredients over your dry ingredients and whisk together until well combined. Pour cake batter evenly around your floured bundt cake pan, smoothing it with a spatula if necessary. Bake for 55-60 mins (I usually do the full 60, as long as the top isn't looking burnt), or until a knife inserted in the center comes out mostly clean. It doesn't really come out completely clean, but it should only have trace amount of moisture left on the knife. Once your cake is done baking, remove it from the oven and let it sit for about 15 more minutes in the pan. Turn it upside down onto a cooling rack and give the bottom of the pan a few strong taps to make sure it all comes out in one piece (I've never had a problem with it falling apart at this point, but just for good measure). Let the cake cool while you make some delicious Creamy Caramel Sauce to drizzle over top! 1. Preheat oven to 350 degrees fahrenheit, and lightly grease and flour a 10" round bundt cake pan. 2. In a high speed blender, blend together the apples, bananas and maple syrup. You may have to stop the blender to push down the apples intermittently. I usually blend the apples and maple syrup first, then add the bananas in through the top of my Vitamix once the apples have started blending well. 3. In a large mixing bowl, combine the oat flour, almond flour, whole wheat flour, nuts, baking soda, baking powder, and salt. 4. 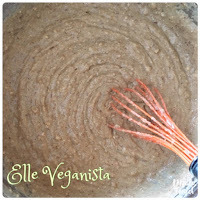 Pour the wet, blended ingredients over the dry ingredients and whisk together until well combined. 5. Pour the cake batter evenly into your floured bundt cake pan, and bake for 55-60 minutes, or until a knife or toothpick inserted in the middle comes out mostly clean (very minimal batter may be seen on the knife). 6. Remove from oven and let sit in pan for an additional 15 minutes before turning out onto a cooling rack, giving a few good taps on the bottom of the bundt pan as you turn it out. 7. Cut any leftover cake into individual sized pieces and wrap each piece in plastic wrap. Place individually wrapped pieces in an airtight container and store in the freezer. *for a smoother texture, you can omit the nuts and increase the amount of almond flour instead. My kids prefer it this way, because it's nice and smooth and they can't see the nuts.